It’s hard to believe summer is already wrapping up! We’ve had a busy summer at Faithful Servants and I wanted to provide some updates about the exciting things that have been going on in the last few months! First of all, I want to take a moment and thank two organizations who have awarded grants to grow the services we can provide to our patients. Northeast Ohio Golf Charities awarded us a large grant to purchase a Piccolo and Hemoccue machine for our South Akron location, which is an incredible blessing as we care for patients with transportation barriers which limit their ability to travel for bloodwork. Additionally, Valmark awarded us a grant for a variety of medical equipment for both our Tallmadge clinic and our mobile sites, and in the future to have a CBC machine which will enable us to run a complete blood count at our Tallmadge location (currently on back-order but will hopefully be able to have this up and running in the next couple of months). These are very exciting updates and we’re grateful to both of these foundations for their gifts! Second, I wanted to update you on some of the summer happenings! Faithful Servants has had 3 separate clinics for youth sports physicals over the last 2 months! 80 kids came through the doors of our South Akron and Windham locations in preparation for their fall sports. 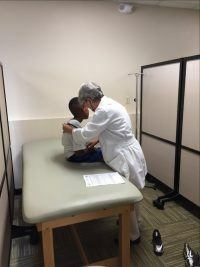 In addition, we had a pediatric cardiologist who volunteered his time to come and perform on-site echoes on children who have murmurs to determine whether they are safe to play or need formal cardiology to follow up. And we all had a lot of fun with this! Let us remind you of our upcoming September festivities! The Faithful Servants Fun Run is Monday, September 3rd (Labor Day) in Tallmadge. You can find more information at FaithfulServants5k.org – Invite a friend or make it a family event! The 6th anniversary Gala is September 15th at NEOMED in Rootstown, OH. Contact us for more information. Thank you to our incredible volunteers who provide excellent and compassionate care to the uninsured in our community! Please contact Barb Warfield with any questions!